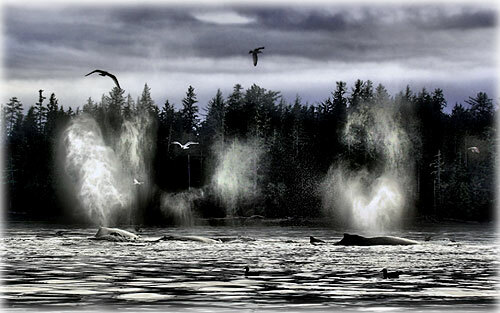 Humpback whales blowing at Bond Bay. Southeast Alaska: Net Recycling - Alaska's on-again, off-again, experiment with recycling worn-out fishing nets is on once more. CoastWise Alaska reports on how five coastal Alaska communities have jump-started net recycling efforts. There are some 500 fishermen in the seaside Alaska community of Cordova, near Prince William Sound. Each of them uses their share of fishing nets made from nylon line and webbing. Eventually, these nets become damaged beyond repair, and they need to be thrown away. Through the years, various groups would collect and recycle them. But just as often, the nets would end up at the town's landfill. Torie Baker lives in Cordova, where she is a salmon fisherman and extension agent with the Alaska Sea Grant Marine Advisory Program. Baker said, "In Cordova, web recycling has been an on-again, off-again project, oh, for at least 20 years. And I think that's probably the case in many coastal communities. And usually what has been the big bugaboo for these kinds of programs to continue has been the basic economics of getting backhauls from these communities to primarily the Seattle area, and connecting up with the major recycling yards." Southeast Alaska: SHI SPONSORES LECTURE SERIES FOR NATIVE AMERICAN MONTH - Sealaska Heritage Institute (SHI) will sponsor a noon lecture series in November in Juneau to celebrate Native American Month. The brown-bag lunch series will focus on topics such as Native history and languages, Native art and the statehood movement. "Native people have such a rich history in Alaska, but much of it is not taught in schools," said SHI President Rosita Worl. "We hope to highlight our history in November in honor of Native American Month." Tlingit leader Byron Mallott will give a lecture on Monday, Nov. 2, on the development of Alaska Native corporations created under the Alaska Native Claims Settlement Act and the efforts by Alaska Natives to transform the corporations into "Native" institutions in the face of Congress' competing intent to assimilate Alaska Natives economically through profit-making corporations. Mallott is the former CEO and President of Sealaska Corporation and serves as a Fellow with the First Alaskans Institute. He is the clan leader of the Kwaashk'i Kwáan Clan of Yakutat. Jeane Breinig will give a lecture on Wednesday, Nov. 4, on Southeast Native perspectives on statehood. Breinig is an associate professor of English at the University of Alaska Anchorage. Her teaching and research areas include American Indian and Alaska Native literature, American literature, and American ethnic literature. 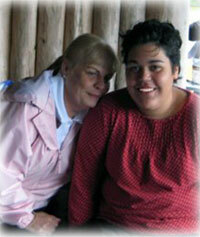 Her publications include articles and books documenting Alaska Native oral histories. She is Haida, originally from Kasaan, TáasLáanas, Raven Brown Bear. Alaska Science: Journey into the Valley of Ten Thousand Smokes By NED ROZELL - Almost 100 years after the largest volcanic eruption of the 20th century, the Valley of Ten Thousand Smokes is still a moonscape of ash and volcanic rock, without a tree or shrub in sight. The valley, located on the Alaska Peninsula where the Aleutians hook on to mainland Alaska, is a silent reminder of the power and potential of Alaska's volcanoes. 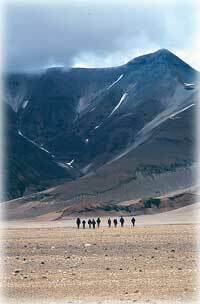 Hikers traverse the Valley of Ten Thousand Smokes on the Alaska Peninsula, walking on a sheet of ash and volcanic rock more than 500-feet-thick. I once visited the valley as one of a dozen people on a 10-day field trip with John Eichelberger, formerly of the Alaska Volcano Observatory, now with the United States Geological Survey Volcano Hazards Program in Reston, Va. As we approached the valley the first day on a bus ride from Brooks Camp in Katmai National Park, the story of the 1912 Katmai eruption began to unfold. A few miles before we reached the valley, we saw the skeletons of spruce trees, bone white and surrounded by green bushes. The trees have been standing dead since early June 1912, when falling ash killed them. Getting off the bus and hiking into the valley, we left Alaska for another world. As we walked deeper into the valley on rounded rocks that felt like styrofoam balls, the willows disappeared, the sparrows stopped singing, and the mosquitoes vanished. A grizzly bear had pressed a few tracks into the valley floor, but we saw no other signs of life. Ketchikan: BBBS Match of the Month for September 2009 - A "Sparkling" Match By Susan M. Jaqua - Meet Holly and her Big Sister, Anita Reid, who is a Food and Beverage Manager at The Landing. Holly and Reid were matched on the 30th of December in 2008 and all the magic and sparkle of the season has continued throughout their match. Ketchikan: BBBS Match of the Month for August 2009 - A Gift of Time By Susan M. Jaqua By Susan M. Jaqua - Meet Lieutenant James Speckhart, a Safety Officer with the United States Coast Guard, and his little brother Kody, who starts junior high this fall. Speckhart has been in Ketchikan for eighteen months and is stationed here for a total of three years. Speckhart is a committed volunteer; he spends his free time both as a dedicated Big Brother and as a Unit Commissioner with the Boy Scouts.